Oral History in 2018: What did we learn? The Newcastle Oral History Unit and Collective is celebrating its first full year of operation with our Annual Public Lecture in March. As with any new venture, it has been a year of learning, and an important part of that has been figuring out where we fit into the world of oral history. To help us with that, we made sure at least one member attended each of the four large oral history conferences held in Europe and North America in 2018*, to get a sense of the ‘state of the field’ that we are a part of. So, what have we learned? As oral history is experiencing a ‘boom’ within the academy, oral historians are encountering the challenges of engaging with university ethics committees that don’t always understand the way we work. Those employed within social science contexts don’t always have the support of their Faculty when it comes to addressing the fraught questions of anonymity vs the right to be named. Within Europe, the new General Data Protection Regulation (GDPR) has raised issues many practical issue, but has also generated broader conversation about what ‘consent’ means. Again, this is not a new conversation but one oral historians can never afford to be complacent about. The risk of conducting ‘dangerous’ and ‘challenging’ oral histories has also been the subject of significant interest from oral historians. 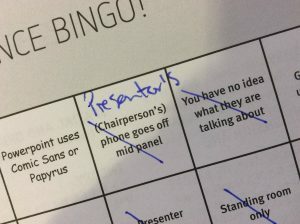 In particular, there are a growing number of conversations on the ways in which oral historians look after themselves when placing themselves in difficult interview situations. With the growth of right wing populist movements in many areas of the globe, the critical thinking inherent in historical and academic investigation is under threat. This was brought starkly, and worryingly, into focus with the keynote lecture at the OHA conference. Leyla Neyzi presented on the impacts of authoritarianism on oral history practice, based on her recent experience of being tried in Turkey for ‘promoting terrorism’ through her work in recognising the Armenian Genocide. Given the growth of intolerance, including challenges to (and subversion of the meaning of) freedom of expression and academic investigation, the role of critical oral history is likely to increase in importance. 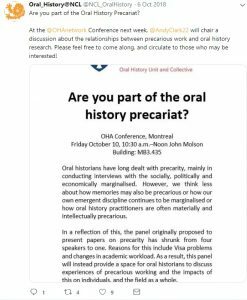 Another related issue – one raise by us, and which gained a lot of traction at the OHA conference – is the issue of precarity and oral history. Watch out for more on this later. Quite apart from GDPR conversations, one of the reasons for these conversations about ethics and care-taking is that oral historians are increasingly working with people who have been involved in war, conflict or disaster situations. This leads to conversations about the safety of interviewers and interviewees – both in practical and emotional terms – and potentially becomes even more pressing as climate change leads to increases in natural disaster and conflict. However, we need to take care to ensure environmental history is not subsumed into the theme of ‘natural’ disaster. A related theme, and once which is important for us here in the North East of England, is oral histories of deindustrialisation, and the structural violence faced by communities in the aftermath of capital migration. Emerging from these discussions was the recognition that those living in areas decimated by workplace closure, regeneration and gentrification reflect and narrate their experiences in terms of historic and ongoing conflict. The question of ‘Who does the city belong to’? will have a significant impact on urban oral histories in those areas and communities most severely impacted by social and economic change. Prior to these three conferences, the 2017 Historical Dialogue Justice and Memory Network conference program included two strong oral history panels, demonstrating the growing links between oral history and historical dialogue. Here at Newcastle, we have adopted ‘historical justice’ as one of our key themes, and we think there is a lot of work to be done in this area. Oral history is an important method for exploring histories of LGBTIQ activism, as well as everyday life. This research is not only telling important stories, but has a lot of teach us in terms of methodologies for reuse of archived oral histories on challenging and controversial topics and practical strategies for interviewers working in ‘difficult history’. A key aspect of the research being conducted in this area is the way in which stigmatization inhibited many people in the gay community from accessing the care that they needed during the 1980s. Key themes emerging from this research are the ways in which survivors and those who did help reflect on their experiences of facing illness and death, and often the survivor’s guilt that follows those diagnosed once treatment became available. Not new, but always developing is the relationship between oral history and public history. Oral history has a strong tradition of social activism, and this is continuing to be important. The opening and closing keynotes at the IOHA conference – Paula Hamilton and Alessandro Portelli (coincidentally, our Annual Public Lecture speakers in 2019 and 2018 respectively) were great examples of activist oral history, with Hamilton addressing the #metoo movement, and Portelli challenging the issue of borders and migration in Europe. The OHS conference explored the idea of museums as ‘safe’ spaces for dangerous and challenging oral histories. Of course, almost all oral historians now use digital recording devices, but increasingly, we are getting involved in digital archiving and dissemination, whether through online summary tools like the Nunn Centre’ Oral History Metadata Synchonisation (OHMS) service, digital exhibitions like the Australian Generations’ ‘Glorybox to Grindr’, or oral history podcasts. Oral histories are also being used as source material for a range of augmented reality (AR) heritage projects. Oral history and (or as?) creative practice has grown substantially over the last few years, and these conferences reflected the activity in this area. Increasingly, academics from a range of disciplines are exploring the possibilities of interpreting narratives through art, poetry, literature and others. The OHA conference really pushed this theme, by tying in an exhibition and performance programme. An important question for all oral historians is the extent to which the practice of oral history is creative. Recognising that all interviews are creative practice opens up new and exciting conversations on outputs, dissemination, engagement and impact. 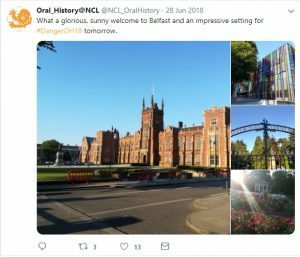 This blog post has not captured the full range of topics and discussions that took place, and are taking place, among oral historians around the world; however, these are some of the major issues that we feel have shaped the discipline during the first year of the Oral History Collective at Newcastle. There is a lot of activity and this shows no signs of slowing down. Our job as a Unit and Collective over the next year is to continue to engage with these global conversations, be aware of changes in research directions, and to support and collaborate with oral historians in Newcastle and the North East. We welcome your (the wider Collective’s) feedback and ideas about what might be missing. 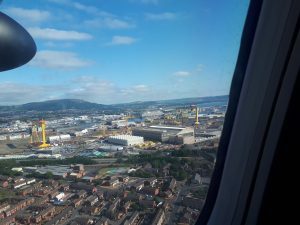 This entry was posted in Conference Report, Historical Justice, Oral History Collective, Public History, Reflection and tagged creative practice, deindustrialisation, digital humanities, GDPR, interviewing, life history, memory, OHS, oral history, public history by Alison. Bookmark the permalink.